The Backwoods Engineer: Still Don't Think DHS is Planning for Civil War? Y'all take a good look at this. It ain't a joke. Not a Photoshop. These are actual targets that are being produced and sold by LE Targets to the Department of Homeland Security. These people are all in home settings, many of them looking defensive. Yet, DHS is training their jackbooted thugs to murder them. Still don't think they're planning a civil war? Look at these pictures. Again, each and every one of them is situated IN A PRIVATE HOME. 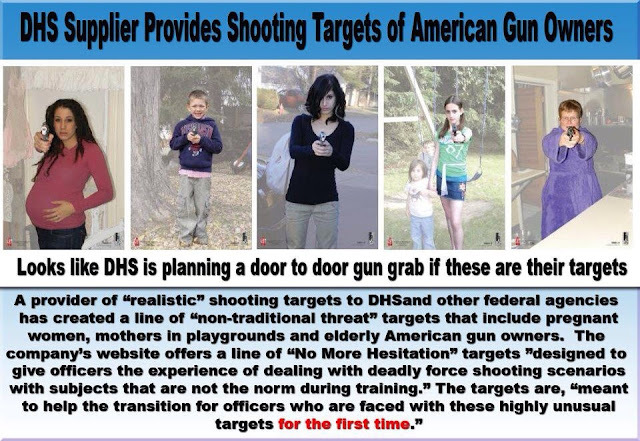 These are practice runs for federal home invasions and gun confiscation. Anyone denying that is fooling themselves. UPDATE: The Blaze has more on this story. Do we know the name of the company producing them?